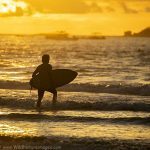 Blog Where to go in Costa Rica? Fellow Alaskan Dan Kehlenback is looking to travel to Costa Rica next winter, and asked Ron for recommendations on a general area in Costa Rica for photography. This is a tough one – I have a feeling pretty much anywhere outside of San Jose is probably worth visiting. It is such a beautiful and diverse country, it is an amazing destination. I should add, there were two destinations that were high on my list that we didn’t visit. We never made it to the East Coast – I would have loved to have seen Tortuguero. And, we were unable to travel down to the Osa Peninsula – I think I would have loved the more remote nature of this coastal region. Of the places we visited, here were my favorites and why. Arenal / La Fortuna – more specifically, Arenal. I loved the diversity of this area. There were hanging bridges through rich, thick rain forest, a large lake and a very active volcano! We stayed in a place with a view of the volcano – the hotel offered a wake-up service if the volcano began to erupt during the night so that you could get up to watch. It kind of reminded me of the wake up service Denali area hotels offer for northern lights. We were able to see lots of wildlife, often up close, including monkeys, snakes, green basilisk lizards, poison dart frogs – the monkeys were a blast to watch. 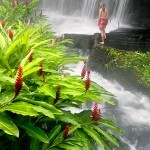 But the highlight of the area had to be the Tabacon Hot Springs. 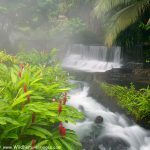 Granted the rain forest is maintained by humans there, so it looks a little better then the natural forest, but it is sure beautiful, and the hot springs are very relaxing after a day of photography! This isn’t the place for laying in the sun, because of its moderate elevation, it is often cool and cloudy with rain. We actually stayed on site at the Peace Lodge – by far the nicest place we have ever stayed. It was fairly new then, and much cheaper – but if money isn’t a problem, this place is amazing. By staying at the hotel, you gain access to the trails, waterfalls etc. before and after the general public. The Waterfall Gardens includes a couple of miles of trails that take you to and around four large waterfalls, as you parallel a wonderful rain forest river – it is a very beautiful setting. There are numerous plants and flowers around the area, and many birds come to the feeders spread throughout the grounds including a wide variety of humming birds. Looks like they have added some kind of frog, snake and butterfly exhibits along with a Trout Lake, the Lodge looks different from when we visited, but every bit as nice. Even though Manuel Antonio has a wonderful National Park, this area is a distant third to my above two recommendations, I will get to why in a second. Manuel Antonio was on the west coast – because of this location, it was warmer and sunnier then the other locations – a nice benefit when escaping the Alaskan winter! Again, there was a wide variety of wildlife, and many different species of monkeys and birds then we saw in the interior destinations. Seeing the ocean is always a treat, and I loved the sunsets. This area had two drawbacks, especially for photography. The hours of operation for the National Park were 7:00 a.m. to 4:00 p.m. A quick search on the internet shows this is still the case. In short, you couldn’t get access anywhere close to sunrise or sunset. The sun in this part of the world rises and sets really fast, so the nice light is literally right at sunset or sunrise, so by the time you could enter the park, the light was very harsh. The other drawback; it was a very popular tourist destination, so the crowds were far larger then in the other areas we visited. We spent a little time in San Jose, and I wouldn’t go back. It was a very crowded, busy city where we were constantly reminded to be careful carrying our camera gear because of crime. In fact, they had to unlock the front door to the lobby every time we came and went from our hotel. We also spent time in Dominical. This area has a lot of appeal – it is a small town on the coast – two things I like. When we were there, they had lots of warnings about never leaving any valuables unattended in your room. There was no way to lock the room, and the motion sensor alarm system was broken. So that meant lugging all my camera gear and a laptop computer every time we went anywhere, even for the shortest of hikes. Couple that with a near constant heavy rain, and it quickly became in practical. Gosh, all this writing about Costa Rica has me wanting to return! 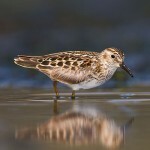 By the way, if you get a chance, check out Dan’s photos (see link at top of this post) – he has great photos of not only Alaska, but places like Guam, Porta Rica and the eastern U.S. as well. How do I use Bokeh? Wow! Thanks, Ron! I recently picked up a guide book to Costa Rica and will now reference your blog entry with the information in the guide book. Many, many thanks!!! Looks like a neat place, the bridge may be a scarey to walk on. Did you make it to the Monteverde Cloud Forest, and the nearby hummingbird gallery? My wife and I honeymooned in Costa Rica 15 years ago, and had a wonderful time. Sounds like there’s been a lot of development in the Arenal area since then. We missed many of the places you mentioned. Instead, we enjoyed staying at an eco-retreat on the Osa Peninsula, and rafting the Rio Pacuare, as well as visiting Arenal and Monteverde. Yeah Dennis, with that wire mesh decking, it was a bit spooky! Hi Ben, we didn’t make it to Montevarde – that was another place on our list. The Waterfall Gardens was in similar terrain. An eco-retreat on the Osa Peninsula would have been fun! Funny timing on this post. I’m just not coming out of post trip hibernation from of all places…. Costa Rica. I spent two weeks there traveling to several locations. The bulk of my time was spent on the lower Osa Peninsula and at Corcovado National Park. I also spent time in Monteverde, Arenal and in some of the resort locations in the northwest corner of the country. Like you Ron I spent most of my time on the west coast and would love to go back to explore the east coast. 1. The Osa Pensinsula (and Corcovado if you can swing it) is an absolute must. 2. Monteverde and the cloud forest area is also a must see. In both locations you can see a variety of wildlife relatively easily (a broad variety of birds, sloths, monkeys, reptiles, insects, armadillos, frogs and if you’re lucky wild cats. 3. Arenal was great, but hit or miss depending on weather. There are plenty of neat places to explore in the area. I highly recommend staying at the Arenal Volcano Observatory Lodge for the best view of the volcano. Definitely visit the Butterfly Conservatory here and take the river trail for a short day hike. You’ll find the best access to Howler Monkeys anywhere in the country. Also visit the Serpentarium here as well. Its a quick way to get up to speed on the local snakes if you take more adventurous hikes. Humidity is a challenge see my write up on how to cope with it while shooting digital. Personally I didn’t think Tabacón was worth the $65 to get in and they’re now enforcing a no photography policy the best that I could tell. If you go down to the Osa Peninsula through Puerto Jimenez let me know. I have a guide to recommend. Oh lastly when in Monteverde be sure to go on the Zip Line at Selvatura Park. UNBELIEVABLE and the hanging bridges blow every other park out of the water. Truely an amazing location. Thanks a lot for the detailed comment Jim! I’m disappointed to hear Tabacon was enforcing a no photography policy. How short sighted! I have had photos from that place appear on the cover of both Frommer’s and Foldor’s travel guides – you can’t buy that kind of promotion! I don’t get it. Not sure what brought about the policy. Maybe something was lost in translation but I’m pretty sure I saw a sign asking people not take photos. Thanks for posting my comment. Not sure why the original coment didn’t go through.